Faith Media Center Player, the world's first global digital ecosystem joining worship centers with their congregations worldwide. In this modern age of technology it made perfect sense that someone should develop a system that would allow worship centers to connect directly with their congregation and also allow the congregation to connect with the worship center. 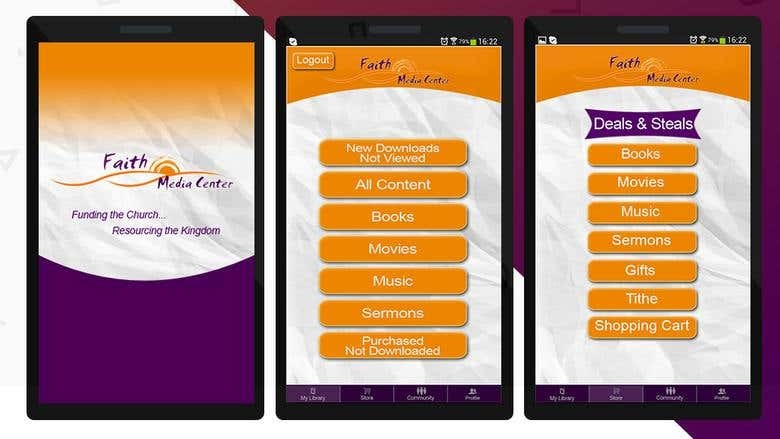 This would be the perfect synergy and help perpetuate the core values that are ever present in the world today… The Faith Media Center App is the most diverse application in the market today. It is a dynamic system that allows communication, in real time, giving congregants of worship centers information about events, groups, and ministry, pastoral doctrine and general and special giving. The app allows congregants to sign up for events, join groups, give to the missions of their choice in a very private and confidential way, receive special announcements and check in for themselves and their children.